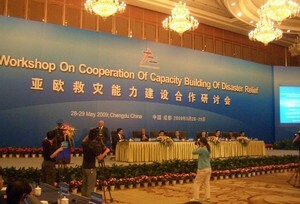 ASEM (Asia-Europe Meeting) Workshop on Cooperation of Capacity Building of Disaster Relief, organized by the Ministry of Civil Affairs and the Ministry of Foreign Affairs of China, was held on 28-29 May in Chengdu, China. In the opening ceremony speech, Mr. Li Xueju, Minister of Civil Affairs of China noted that Europe and Asia should reinforce the exchanges of knowledge and experience and cooperation in disaster reduction and relief. Asian countries have rich experience in disaster relief, while the European countries possess advanced technology and management concepts. Both sides should overcome their own shortcomings by learning from each other's strong points. Total of 160 representatives from 32 member countries of the Asia-Europe Meeting and international organizations are present at the workshop. The workshop focused on four core thematic areas: (1) disaster preparedness and emergency relief; (2) rehabilitation and reconstruction; (3) public-private partnership in disaster relief; and (4) disaster reduction and risk management. ADRC made a presentation entitled "Build Back Better" to introduce the activities of its own and IRP(International Recovery Platform). Participants also visited the earthquake-affected areas in Dujianyan, Sichuan Province.